A severe winter storm in January, 1910, was responsible for temporarily disrupting the community's everyday activities. Here, a trolley car on the electric line to Onset is seen stalled midway up Barden Hill. At the left is the Caswell House which stands on the corner of Wareham and New Water Streets. A crew of men is busy clearing the tracks. Such crews were accustomed to keeping the street railways passable, but frequently winter storms forced the suspension of service on the electrics, and sometimes worse. 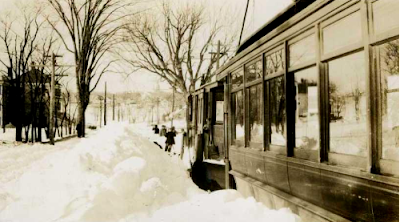 In February, 1913, icing of the tracks caused the derailment of one of the Taunton and Buzzards Bay Street Railway Company's trolleys in Middleborough.